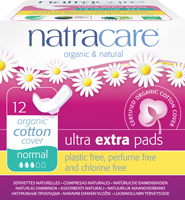 Plastic-free and totally chorine-free, Natracare pads do not contain rayon, latex, chemical additives, fragrances or dyes. An ecologically certified absorbent cellulose core locks away menstrual fluid to keep you dry and a soft organic cotton cover allows your skin to breath. Many gynecologists recommend Natracare for people with sensitive skin. Did you know conventional menstrual pads are made up of 90% plastic materials?! This is why in 1989, Natracare developed the world’s first range of natural menstrual products, and have been perfecting them ever since. Take a look at our different ranges of pads, all offering high quality protection which keeps your skin free from synthetic materials and unwanted chemicals. Single-use plastic pollutes the environment and can irritate the skin. We use over 99% biodegradable and compostable plant cellulose instead of super absorbent polymers. Every year, over 45 billion menstrual pads are disposed of! Most are full of synthetic materials such as plastic that do not break down in the environment for hundreds of years. So, we ensure Natracare products are between 95% and 100% biodegradable and always compostable. At It's Your Period, we only sell period products that don't harm people or the planet.